Showcasing Burkinabé cuisine one meal at a time – today, attcheke. 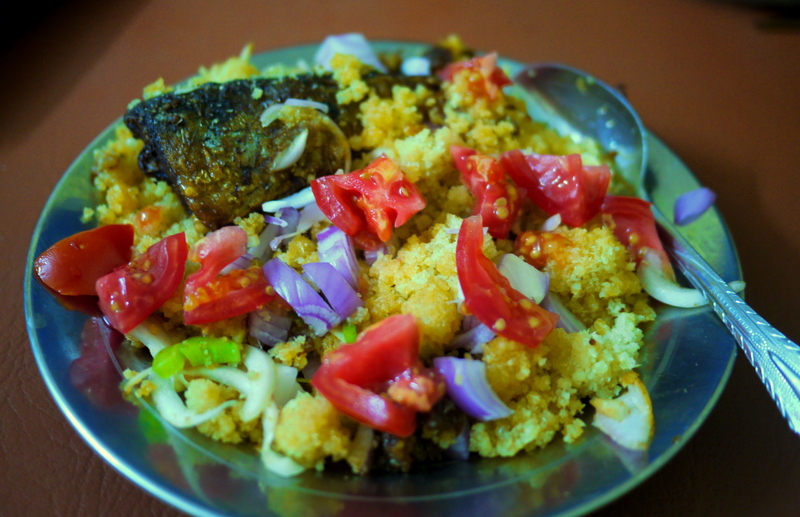 Attcheke, a manioc cous cous-like dish served with a few onions and green peppers is another carb filled typical meal here in Burkina Faso. The meal is often garnished with a fish for 200 CFA more, and my favorite version is from a restaurant in Ouaga that mixes in a bit of mayo that makes a nice sauce. The example above is from a kiosk next to the town square in Fada, though I added some of my own tomatoes and onions to make it a little less carb-dominated. Cost (including fish): 450 CFA ($1).